Accept credit and debit cards online, on the go or at your counter. The solutions are here, are easy to use and provide you the flexibility you need. The Bank of Washington is partnered with Sync Payments to bring you the products and services you need to start accepting credit and debit cards at your business. If you are a Bank of Washington customer, you have the option of choosing any partner you would like for these services, but we've done the research, and we think Sync Payments is where it's at! On your own mobile device. Accept Visa®, MasterCard®, Discover® and American Express® - plus EMV (chip cards) and contactless payments like Apple Pay™ and Samsung Pay. If your transaction volume is under $4,000 per billing cycle, you qualify for simple pricing! Pay the same, one price, for each swipe and one price for each manually entered transaction. If your volume exceeds $4,000, you receive custom pricing that is better designed for your volume! Receive the deposits into your account the next business day. Comparable to Square®, but better! You have our customer support team and Sync's customer support team on your side to help you with anything. You also receive custom pricing if you have high processing volume. Plus more! Small Business - Simple pricing. If your transaction volume is under $4,000 per billing cycle, you qualify for simple pricing! If your volume exceeds $4,000, you receive custom pricing that is better designed for your volume! First reader at no charge! EMV upgrade for $75-$99 one time charge, depending on product selection. Qualifications apply, ask for more details. Away from or at your counter with a dedicated card reader that can be mobile. Mobile flexibility without utilizing a personal cell phone. Pricing varies per card type to provide you with the best savings. Custom pricing designed for you. Terminal is FREE with $100 programming charge and $25 annual usage fee. Qualifications apply, ask for more details. At your counter - plus a full scale point-of-sale (POS) system. Accept virtually all payment types, including EMV (chip cards) and contactless payments like Apple Pay™ and Samsung Pay. Allow employees to clock-in and clock-out. Manage your inventory and discounts. Clover Station is intuitive, easy to use and equipped with software that will improve your business. It's customizable to meet your individual needs so it will make an impact from day one and last for the long run. Qualifications apply, ask for more details. At your counter on a smaller device - plus a full scale point-of-sale (POS) system. Accept virtually all payment types, including EMV (chip cards) and contactless payments like Apple Pay™ and Samsung Pay, with a smaller device than the Clover Station. Clover Mini is small, powerful and looks good too. It accepts virtually all payment types and has the ability to scale up to full point-of-sale (POS) functionality. As you grow, it can grow with you with specialized apps from the Clover App Market. Qualifications apply, ask for more details. Away from the counter (mobile) - plus a full scale point-of-sale (POS) system. Accept virtually all payment types, including EMV (chip cards) and contactless payments like Apple Pay™ and Samsung Pay, on the go. Plus, manage inventory, schedule employees, etc. 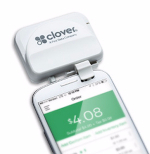 Whether you want to take payments tableside, bust register lines or just generally on the go, Clover Mobile payments is the device for you. As you grow, specialized apps from the Clover App Market let you do everything from managing inventory and discounts to scheduling employees and tracking tables. Qualifications apply, ask for more details. Card Not Present and B2B. Premium solution for B2B payments and for general card not present merchants. A spectacular solution for B2B recurring billing and for securely tokenizing cardholder data for later billing. Qualifications apply, ask for more details. Accept virtually all payment types on your website. Payeezy is the dynamic eCommerce solution needed to create a seamless website experience, giving merchants an easy way to boost sales online. Qualifications apply, ask for more details. Put some extra defense in place from hackers when it comes to protecting sensitive payment information. Reduce your liability in the event of a breach. Brought to you by the leader in secure transactions, First Data. TransArmor delivers state-of-the-art data protection to business of all levels. Available on Clover products. Learn customer behavior and better target your best customers. Harness big data and keep customers coming back! Revenue tracking, customer management, social media marketing potential. Turn your payment data into revenue. Provide loyalty and rewards programs. Integrated into payments and gift card programs. Increase merchant revenues with customer designed loyalty and rewards programs. Sell digital and physical gift cards to your customers. Digital platform is available to offer digital gift cards that can be bought, sold and redeemed - all from your customers' phones! Let your business shine with digital or plastic custom branded cards. These are the most popular programs, but Sync also offers a number of additional options. They will work closely with you to make sure you get exactly what you need! Contact us today to get started. Sync Go Program with Clover Go! 2.69% on swiped cards - under $4,000 in volume. Custom pricing designed for you over $4,000. 2.75% on swiped cards less than $400. If over $400, there is an additional $275 fee. 3.39% + $0.19 on non-swiped cards - under $4,000 in volume. Custom pricing designed for you over $4,000. 3.50% + $0.25 on non-swiped cards. Funds not held under normal conditions. Funds can be held for 30 days without prior disclosure. Phone support, email support, local service, leverage bank supported relationship. You are on your own. No phone support. Got a question about a deposit or transaction - send an email and hope for a response in a few days. Apple Pay and Chip Card reader option ready! $55 device required. Apple Pay and Chip Card reader not ready. $49 "pre-order" with no ship date commitment. One-on-one personal setup available. Need help? Send an email and wait. Regardless of rates, the biggest difference is that Sync and the Bank of Washington are both here for you. You know us, you can talk to us, if you have questions on any of your transactions or on the device itself, we are here for you. With Square, getting answers can be tricky.